Pneumatic Control valves are used to start, stop, regulate, relieve or change the direction of flow of air or a fluid in all compressed air and process control systems. Compressed air can then be used as the power to operate equipment and machinery. These valves are designed for very specific applications and a factory or process may use several different types of valves with each being intended to do a particular job. For example, some valves may control the speed and others the sequence of an operation. Valves play an important role in the safe operation of machinery also. Norman’s proven expertise and large inventory offers precise air and process control in a variety of solutions and configurations. Valves can be manual (i.e. lever, push button), motor actuated or solenoid air (pilot) operated and electrically actuated with many mounting options. Basic valves include flow control or directional valves, pressure valves, check valves, relief valves, and shut off valves. If necessary our fluid power experts and factory resources can help you Custom Design the valve you may require. 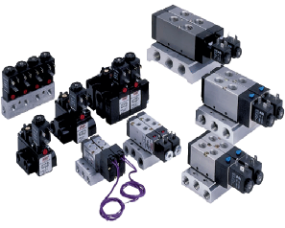 We carry the most comprehensive line of solenoid valves to support all industrial applications. We provide the expertise and products to make your application work efficiently and cost effective.